We are an organization that formed in memory of Isobel June Schissler. Isobel was born with Spinabifida and in her four short years here on earth, she provided smiles to many. Her favorite things included being able to play and move around like other kids along with experiencing many family vacations. It is our mission to continue to spread her smile to many. Our hope is to be able to fund grants for families and individuals to experience new things by accessing equipment and providing opportunities to SMILE. To learn more about Isobel's journey, feel free to check out our blog below. Ahhhh February. On the 21st Isobel should be here celebrating her 7th birthday. We should be planning a last minute birthday party in true Schissler style. Figuring out last minute what the plans will be and stressing out over some silly Pinterest ideas I found and feel like I MUST do. Instead, we sit here trying to figure out last minute Schissler style how to honor her memory on her birthday. A Pinterest search for that doesn't have lots of cute ideas. On Isobel's last birthday on earth, we were in the hospital. I remember being there and trying to figure out how to make her birthday special while being stuck in a hospital. I was so very disappointed that the hospital didn't have any decorations for me and Walgreens in walking distance didn't have any decorations for me either. After being a ridiculous mess about it to a friend, she showed up. Bag in hand. Decorations for her room. A goofy hat. A princess wand. A sash for my Princess. A bear. The best decor you could ask for given the circumstances. She danced in her birthday gear to some of her favorite tunes. A moment of true joy. The next day, we would celebrate with so many of you while you supported our family at a benefit. So so many of you got to meet Isobel and Alexis for the first time. Looking back, I'm blown away by that gift. As this little Princesses birthday draws near, grab a last minute plan with me to honor her life. Make someone SMILE. Dance. Do something for a stranger. Pray with someone in need. Donate to a cause. 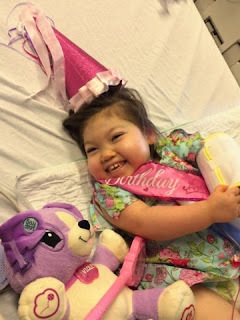 I'm planning to prepare a bag of birthday decor to donate to the hospital for a little girl who needs to be a smiling princess for her special day. I know her life continues to teach lessons, spread joy, and SMILES. I thank God for the love she taught me to give.